SyFy has released a new teaser for The Last Sharknado: It's About Time and it's completely insane. Along with the crazy sharks, dinosaurs and superheroes have joined the mix as well. The first installment of the wildly successful franchise premiered in 2013 and the latest, which will also be the last, premieres on August 19th. The series stars Ian Ziering and Tara Reid as Fin and April Shepard, a husband and wife who can't stop running into sharknadoes, which are obviously tornadoes filled with sharks, wherever they go. It's all about to come to a gigantic, history-making climax. The 2018 summer box office has seen some pretty heavy hitters including Infinity War and Jurassic World: Fallen Kingdom to name a few, which are given the spoof treatment in the latest teaser for Sharknado 6. Tara Reid is spotted in the teaser wearing a superhero costume while dinosaurs are running around. If that wasn't enough, time travel is also involved, which just makes for an even more bonkers storyline for this final installment. The time travel aspect has been teased before, but in addition to the dinosaurs, we're also getting a sneak peek at knights, canons, wars, and other pieces of history. The synopsis even teases that Noah's Ark will be involved. The Sharknado series has seen battles with sharks in Los Angeles, New York City, Washington D.C., and even space, so naturally, the sixth and final installment will see the group fighting against these wild sharks across time. In Sharknado 5, Ian Ziering's Fin character was last seen wandering around alone after the Earth was destroyed. Now, he's going to have to travel back in time to reverse the effects of the fifth installment while finally taking down the sharknadoes for good. In addition to dinosaurs, superheroes, and time travel, Ian Ziering is getting a real-life blast from the past with his 90210 co-star Tori Spelling joining in on the fun for Sharknado 6. Spelling's husband, Dean McDermott, is also making a cameo in the film. In addition to the Spelling clan, Sharknado 6 also includes cameos by La Toya Jackson, Dee Snider, Neil deGrasse Tyson, RuPaul's Drag Race alumna Alaska, and Darrell Hammond. While Spelling's role in the project has yet to be revealed, it's imagined that she will be probably get eaten by a wild shark when all is said and done. 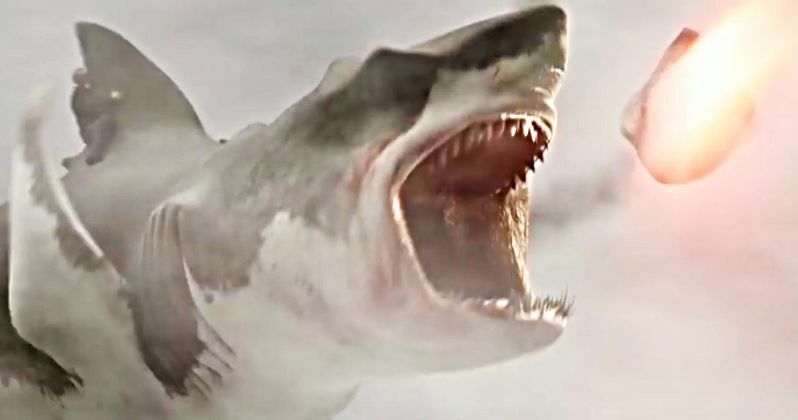 To celebrate the premiere of Sharknado 6, SYFY is celebrating the occasion with a week-long extravaganza entitled Sharknado Week, which will include other shark-themed movies like Deep Blue Sea 2, 6-Headed Shark Attack, and Nightmare Shark. The week will culminate on August 19th with the premiere of the sixth and final installment of the world-famous series. While we wait for the festivities hitting the small screen next month, you can check out the ridiculous teaser below, thanks to the http//www.youtube.com/watch?v=QQG4kKlyCDM|SyFy YouTube channel.